With their successful Kickstarter campaign for Carnival, which funded in less than a day, Dice Hate Me Games solidified their reputation in the indie publisher space. Their enthusiasm for games is contagious, and they had no problem getting others to catch the vision for their first game. (And they won my loyalty by actually delivering my Kickstarted product on time, a feat I cannot yet attribute to other Kickstarter companies.) While they just launched their campaign for VivaJava (which, incidentally, is already funded), today we’re looking back at their last success story, Carnival. What do we think about it? Check out our review below! 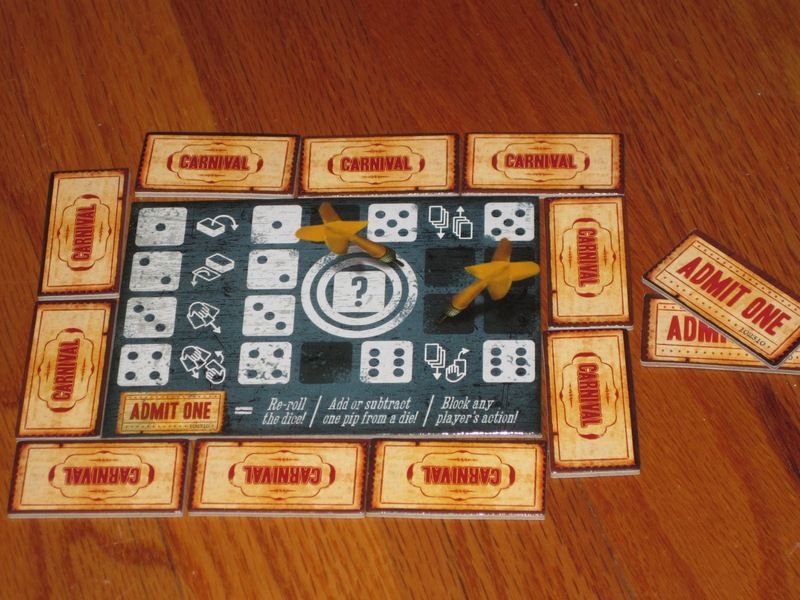 Carnival is a “deck and dice game” for two to four players. The game revolves around collecting sets of the four different parts (seats, lights, materials, and banners) required to build five different carnival rides (ferris wheel, bumper cars, roller coaster, swings, and carousel). The winner is the first player to collect four out of five sets. 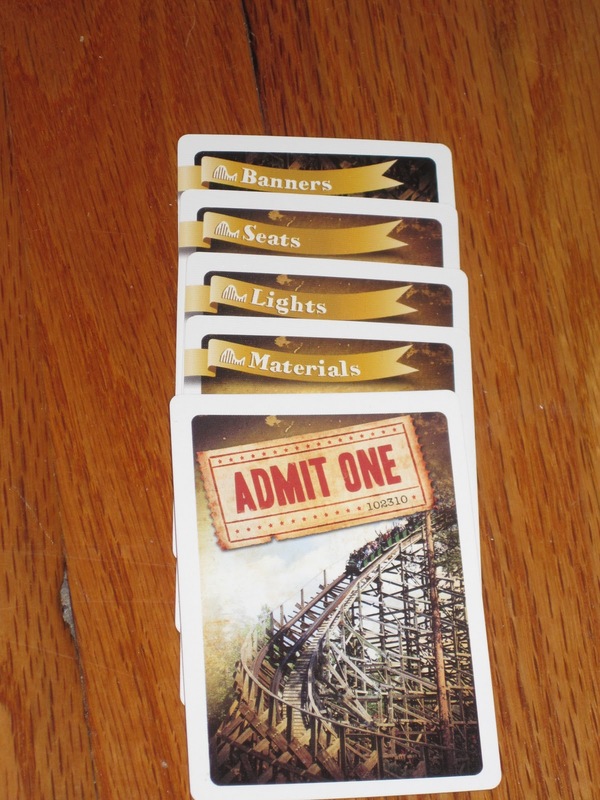 At the start of the game, each player is given five midway cards, one each of cards representing the five rides players can build during the game. These are placed in front of players to form their midways. 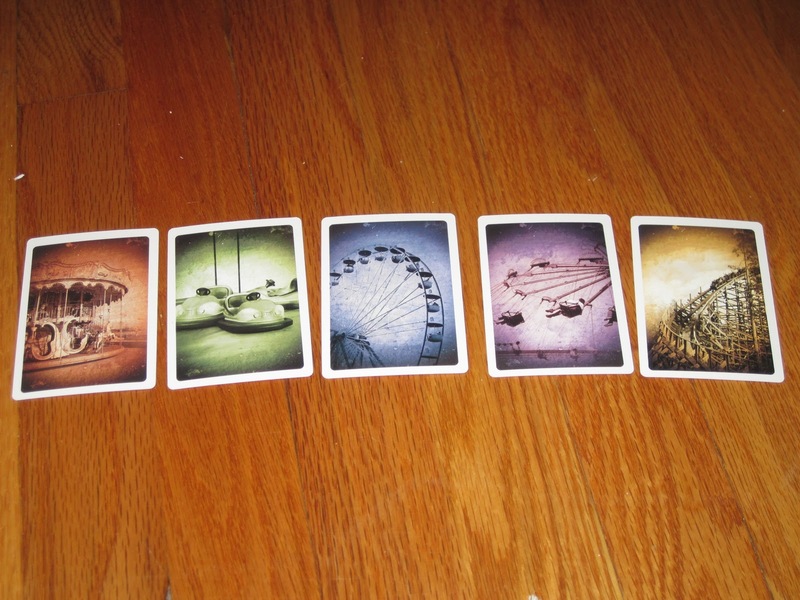 Each player is given three tickets and a wild card and is dealt five cards from the deck (the deck is composed of all parts cards for the various rides and wilds). The beautifully designed midway cards. Can you feel the nostalgia? Players may choose one of two major actions on their turn: discard a wild and any number of other cards to draw that many cards from the deck OR try their luck at the dice. While discarding wilds and drawing (and knowing when to do so) is crucial to the game, a player’s most interesting (and most common) turn will involve trying the dice. When a player chooses the dice, he rolls three dice and assigns two of them to actions on the center tableau. (The exception is that if a player rolls triples, he must take that action three times— dangerous or awesome; you decide!) The dice numbers 1-6 correspond, respectively, to drawing a card from the deck, drawing from the discard pile, drawing from another player’s hand, trading hand cards with another player, trading midway cards with another player, and stealing a midway card from another player. 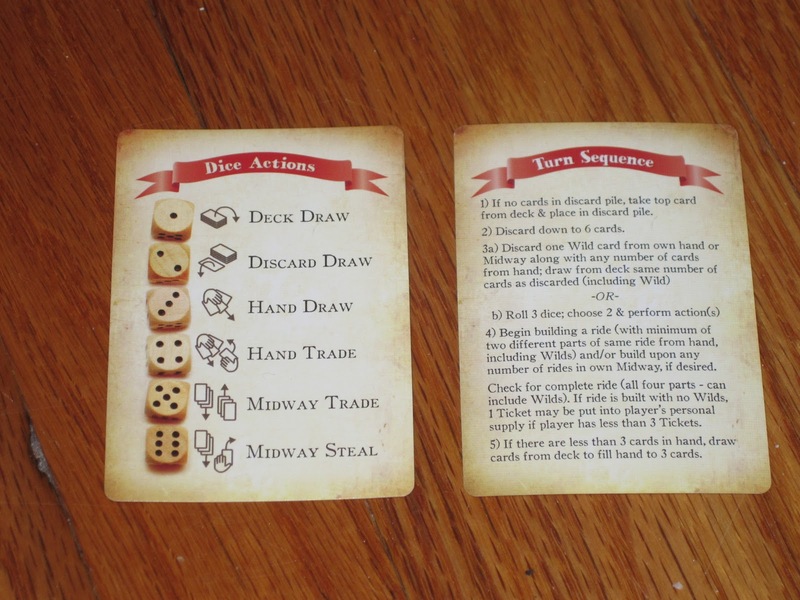 After a player takes one of these two major actions, he may build on his midway by starting a ride with two cards from his hand and/or by adding parts cards to any incomplete ride on his midway. At the end of his turn, if a player has fewer than three cards in hand, he draws up to a hand of three, and play passes to the left. The tableau and tickets, both of sturdy cardboard. All of this seems straightforward, and it is. But this is where the tickets come in. Tickets can be used on your own turn to alter the dice, either by altering one die one pip or by rerolling the dice completely. But as only one ticket can be used for turn, rerolling the dice is a gamble. Other players may also use tickets on a player’s turn to prevent one of that player’s dice actions (usually something that affects that player, but not always). A player can never have more than three tickets, and the only way to replenish spent tickets is to complete natural sets of rides (that is, sets without wilds). Natural sets are also locked, meaning other players may not steal or trade from that ride. The first player to complete four rides (natural or with wilds) is the winner. There’s not much to Carnival, really. At its core, it’s a rummy variant. You draw, you collect sets, you discard. However, unlike rummy, none of these actions is given to players as a right. Players must earn their actions with a roll of the dice. And rolling the dice is something I quite enjoy and that makes this game unique. 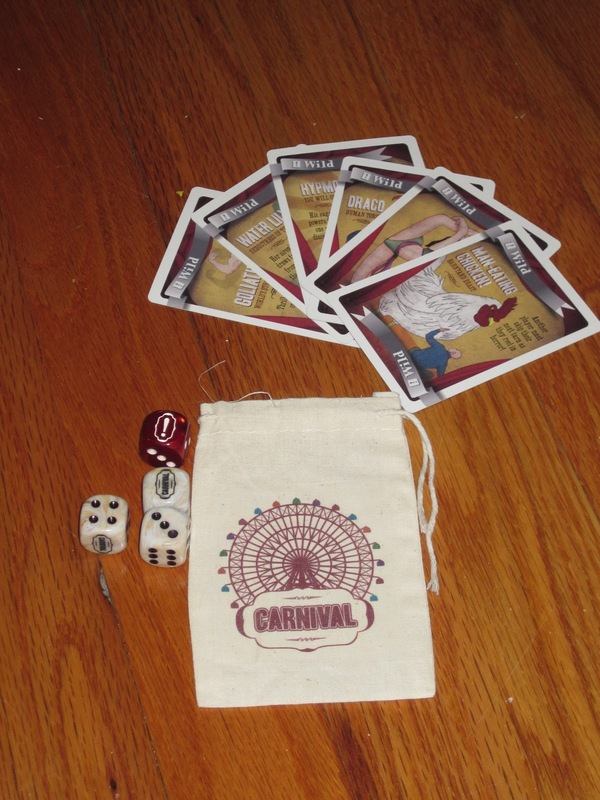 Carnival is a “deck and dice game,” which means it is heavy on the luck. Bad dice rolls can hamstring good strategy, as can bad card draws. But the tickets help to even out some of this dependence on luck. A bad dice roll can be made not quite so bad through tickets. Useless cards can be exchanged with wilds (a move of utility, even if it isn’t the most fun thing to do on your turn). A natural set: a thing of beauty. 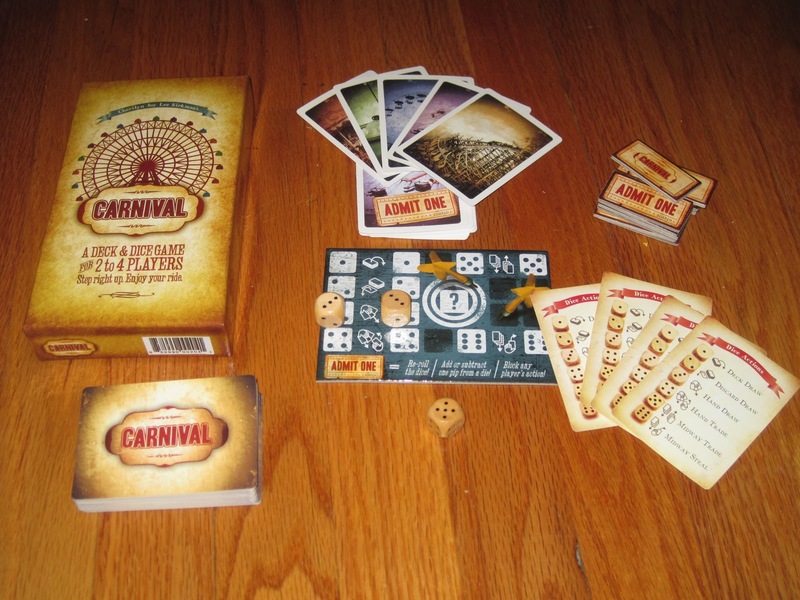 What I like about Carnival is that it is a fun game with four players, but also with two. It has a good deal of interaction, and while it can be played in a cutthroat manner, most of the time a general feeling of goodwill prevails, and the other players at the table will understand when you steal from their midways. Basically, you probably won’t lose friends after a game of Carnival, even though it is competitive and interactive. Carnival also has going for it pacing and game length. Especially with two players, a game can go by quickly, but still be long enough to be satisfying (at least for the weight of game that it is). The game doesn’t overstay its welcome. The dice actions side of the player aid is helpful, but the other side is VERY text heavy. All told, Carnival is a good crossover game. I would hesitate to call it a “gateway” because it feels very much like a general-market game. In fact, I could easily see this on the shelf of the local Target and imagine it finding a warm reception there. Because of this, Carnival may not appeal to your gamer friends (it received a mixed reaction with mine). However, it almost certainly will appeal to your non-gamer friends because there’s enough familiar here to be comfortable while there’s enough that’s new to keep it interesting and fresh. All in all, I enjoy Carnival, even if it’s not a game that fits in many of my regular gaming situations (i.e., with other gamers or almost gamers). It’s a good game, and it proves that Dice Hate Me Games has a bright future ahead of them. Carnival will certainly have its fans, and you may be one of them. Actually, I think @FarmerLenny covered it pretty well. I’m just going to rehash a few things he said for reinforcement, and mention a few more small things. Carnival is an enjoyable game for sure; there’s fun to be had there, and that’s what gaming is all about. It’s light enough to bypass pretty much any chance of AP, since your actions are determined by your dice; and once those are chosen, even the more complex actions (like stealing a card from your neighbors) are pretty obvious. In this case, it’s not a bad thing; Carnival would definitely be a lesser game if it resulted in players studying for 10 minutes the ways of rearranging their pieces. It’s a game you can play and enjoy even while chatting with your friends about another subject. Of course, on the other hand, there aren’t a whole lot of interesting choices to make. As I said, pretty much all your actions are obvious. The only real decisions to make are either 1. when to play a ticket to stop another player or 2. when to discard your wild card and replace cards in your current hand, but even these come at pretty obvious times. To me, there’s no real “hook” to this game – nothing that particularly excites me about playing. You can never make a sweet move or a surprising combo that rockets you to the lead, because everything is just there. Pictured here are Kickstarter exclusives. The Sideshow dice are much better, and I don’t play without the Wild die. The graphic design is overall excellent; beautifully rendered images that evoke a carnival-y feel when you look at them, tasteful effects, and good coloring make the package look quite enticing. However, the design from a usability standpoint is not quite as good. As @Farmerlenny mentioned, the key text on the cards is small and hard to read from across the table (important when deciding which player to steal from or which card to pass them -you don’t want to accidentally pass the winning card because you couldn’t read what they had), but at least it’s written on the top of the card so as to still be visible while cards are overlapped. The iconology is perhaps a bit weak, but the player aide for that, as mentioned, is functional. The central board for dice actions was a little confusing at first, but I got used to it. Being myself, I have to point out that despite the thematic-sounding title, Carnival is extremely light. Other than the images, there’s nothing here that actual evokes a carnival feel – and in fact the things you are building are amusement park rides, not carnival acts. This is essentially an abstract set-collection game, and it wouldn’t change a bit if it were zombies, spaceships, or shopping malls. Take that as you will. I have to echo @Farmerlenny’s complaint about the rules. There’s just no excuse, in my mind, for such incompleteness. The problems we encountered, we encountered very quickly, so I find it hard to believe that these never came up in playtesting. I understand trying to keep rules concise and not forcing players to read a novel before they start playing, but questions have to be answered and players should not have to seek help from the internet when they run into such obvious problems. Game designers and rule-writers take note; clarify, clarify, clarify! Make sure than any question anyone ever asks in a playtesting session is clearly answered in the rulebook. Oh, and hire an editor too. Nothing knocks down the quality of any game like a series of typos and poor grammar. In conclusion, Carnival is an okay game that looks pretty, but with a few minor flaws and no big “hook” to draw you in. It’s a decent filler game, maybe something to pass the time while waiting in a convention line or for everyone to show up at game night, although there are definitely better options out there. It’s a decent first-time-entry from a first-time-publisher, and hopefully DiceHateMe games will learn from their mistakes and bring us some awesome stuff in the future. Previous ArticleNow You’ve got a Ticket to Ride! Next Article FDQ: What Is Your "Vegetables" Game?